Just 20 miles north of Mammoth Lakes, June Lake, California is a small community known for its proximity to June Mountain Ski area and abundant outdoor activities. Nestled against the shore of June Lake, the city of the same name, is a quaint community of just 600 full time residents (thought that number swells to over 2,500 during busy summer months). Boasting access to abundant outdoor recreation, including fishing, skiing, and hiking, the small community also has a full range of services offering residents and visitors dining, lodging and amenities. June Lake is located off California State Route 158, on the eastern slope of the Sierra Nevada Mountains. Looking for quaint and quiet? June Lake is your kind of town. The city boasts a small sampling of restaurants, art galleries, and clothing boutiques. June Lake lodging includes several small lodges and inns. June also has several bait and tackle shops, gas stations, and a small general store. June is a hotbed for outdoor recreation. The lake is famous for trout fishing, and the surrounding wilderness provides abundant hiking, fishing, cycling, climbing, skiing, bird and wildlife watching, and hunting opportunities. This mountain resort, located about 1 mile from town, boasts 35 named trails and more than 2,500 feet of vertical rise. The town is in close proximity to Ansel Adams Wilderness, Yosemite National Park and Devils Postpile National Monument. From Mammoth Lakes, head north on US-395 for 14 miles, then exit CA-158 N/June Lake Loop, and follow until you reach June Lake. 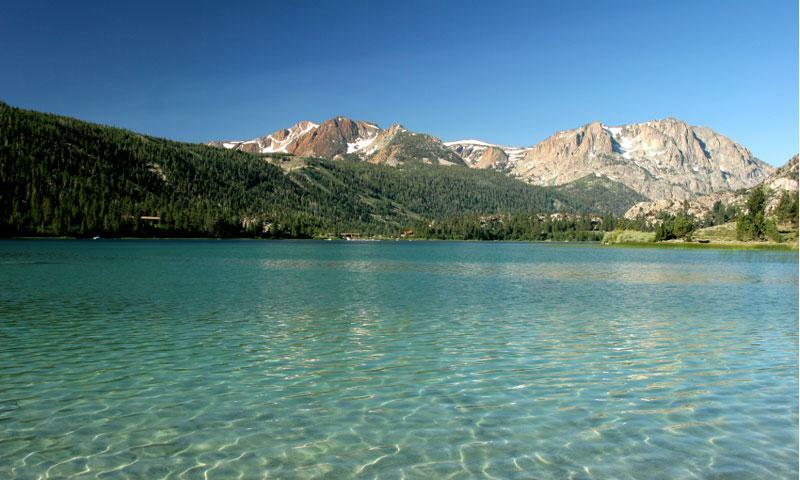 On the way, marvel at the Inyo National Forest and sweeping views of the high alpine terrain.